Agility Dogs, YES! Obedience Dogs...not so much! This year was Flynn and Scout's first time at the 4-H Dog Show. I have to say that they did WAY better than expected. What does it take to get a dog ready to show? Well these boys have been going to dog practices since January! Along with that, they get worked at home. So practice, practice, practice and a BIG dose of patience! I posted about the first dog practice, chaos! We came home from practice on more than one occasion, with one of the girls close to tears. If you don't already know, Border Collies are smart BUT they are also busy. There were weeks that we couldn't get them to focus on the girls for more than a few seconds because they were more interested in trying to herd everyone at practice! I almost bailed and told them, maybe next year. We have had Border Collies for many years, but these two are by far the most intense. If I am honest, they drove me nuts at the dogs practices!! (dogs not girls). The dog show is split up into two days. Tuesday evening is Rally/Agility and Wednesday is Obedience, Showmanship and Grooming. They were signed up for Agility, Obedience, and Grooming (required). Obedience they have to do at least one year to be able to show Agility. We gave the girls the pep talks, " It is their first year, if the dogs don't listen, or get distracted or simply jump out of the ring, well that's okay"- and that is exactly what we expected! Well I am happy to report they did great! We were all surprised, especially the girls. Their 4-H leader said she has never seen the agility course run so fast :) The girls were thrilled and walked away with 1st and 3rd place in Agility with a qualifying score (which means they move up next year). As far as Obedience, they did get first and third place,(Non-Qualifying Score) but it was miserable, for girls and dogs alike! They do not enjoy it at all, much too slow paced and too easily distracted. So this is their one and only year showing in obedience. And the "old" dog, you can tell he has been through it many times, he has no idea why the pups can't get it together and just chill out like he does! As long as there is some one's feet to lay on, it's all good! He should get some "brag time" too. First place in Obedience and Agility and second place in Rally. I should add that he doesn't have much competition because there are very few dogs that show advanced classes. But we think he did great! I am proud of the girls for sticking it out with these boys all year. I am not sure if I would have. It just goes to show patience and hard work do pay off. Even without the ribbons, it was a worthwhile effort and the girls had a great experience. Way to go! You did well! 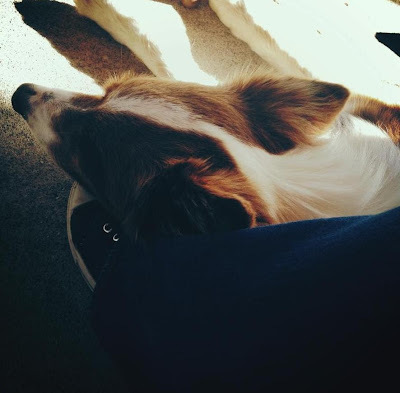 Someone needs to write a book..."Things I Learned From My Border Collies". I learned a bunch from my first one and keep learning with The Gus. I agree! I bet someone has written one. That is so cool! I have never heard of that at our 4H fairs around here. Congrats to the girls! It is a great program! It is like an AKC show but you can show any dog :) They also get training with their dogs throughout the year. I love it! It sounds so cute that first wanted to herd everyone at practice. lol But it seems they worked out what they were supposed to do in the end. Ribbons and qualifying to move up. That's fabulous! I'm glad they did well! I don't know if I'd have the patience for this myself haha.